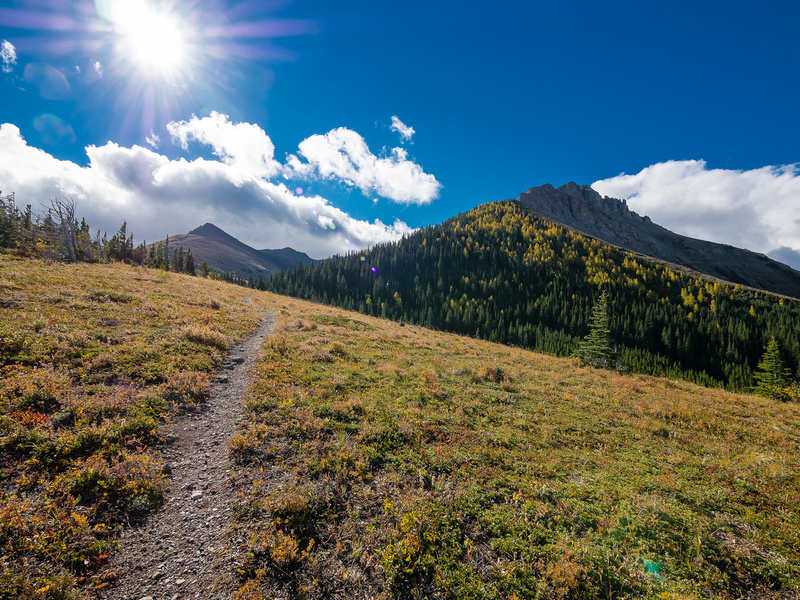 Difficulty Notes: Southfork is a hike with some very minor exposure to the summit (for hikers). 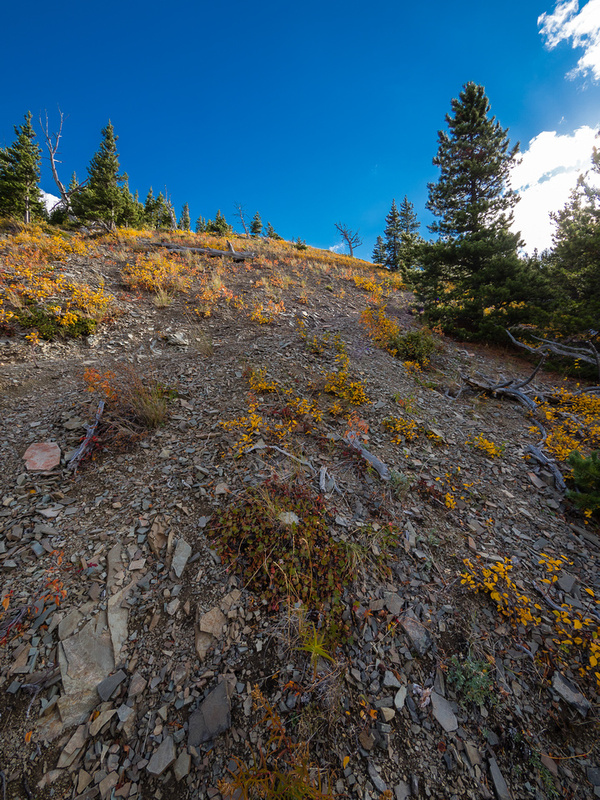 The traverse to Barnaby Ridge is a scramble. Note: The statistics include both Southfork and Barnaby. I’ve been interested in Southfork Mountain and the traverse to (or from) Barnaby Ridge for a while now since reading multiple trip reports on it over the years. 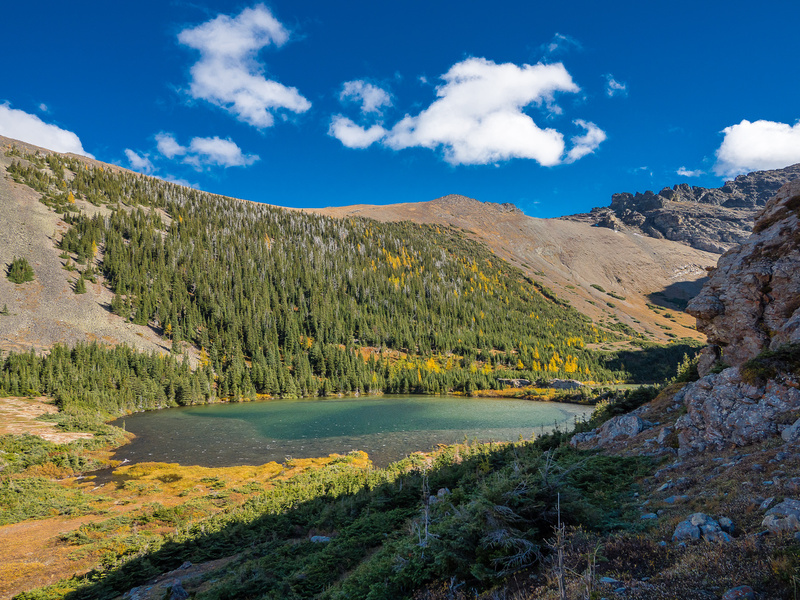 It seemed to be the type of trip that is more effort than you expect – which describes a lot of the Castle Wilderness Area peaks and trips that I’ve done over the years. 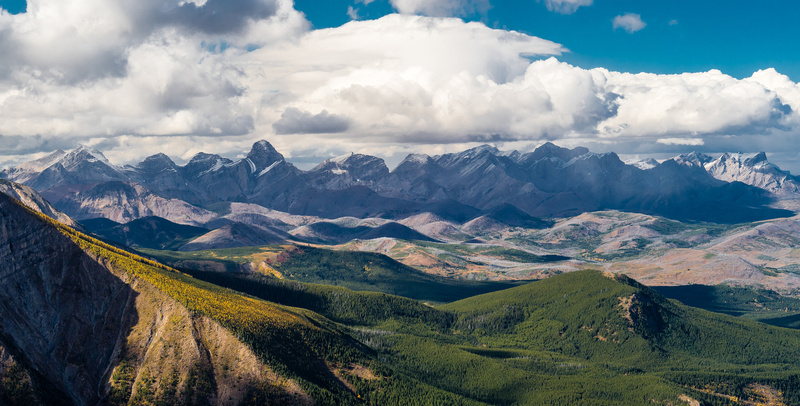 I imagined the views must be pretty sweet, as a previous trip in the area with Wietse up Gravenstafel Ridge and Mount Haig was very scenic. The only problem was timing. 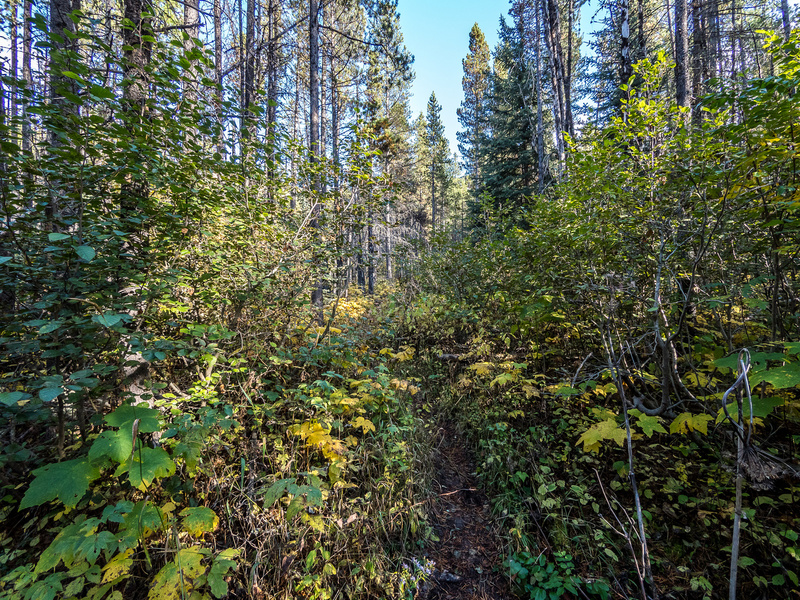 A few weeks ago Wietse, Dave and I drove within a few hundred meters of the trailhead before turning around and hiking McGillivray Ridge and Ma Butte instead – thanks to pouring rain in the Castle area. 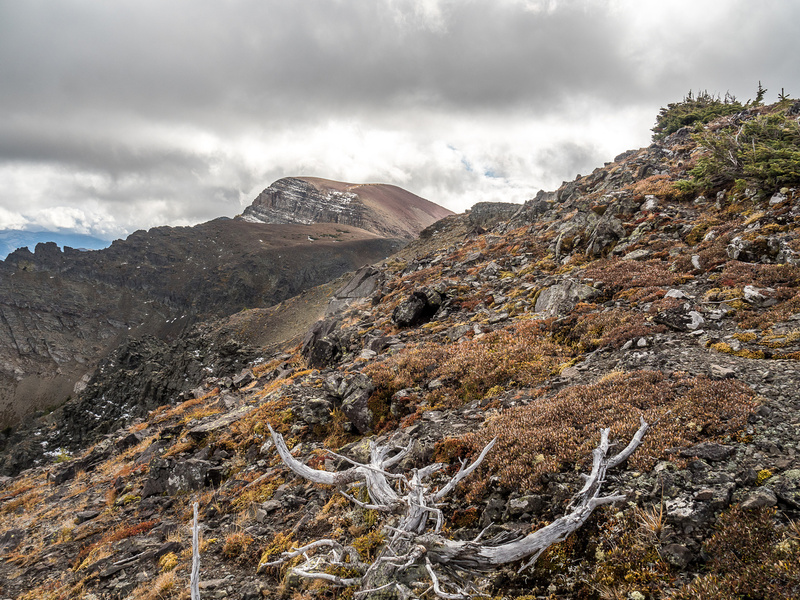 The weather in the Rockies wasn’t looking great on Monday, September 19th and I was feeling a wee bit tired after a 30+km and 2k vertical solo effort on Pharaoh Peak the day before. I didn’t have too many objectives that interested me in the questionable weather in Waterton, so I decided to attempt Southfork and Barnaby Ridge. I have to admit I wasn’t really feeling it as I made the long drive towards the trailhead. I was tired from the day before and my views and experience on Pharaoh was so good that I wondered what I was hoping to accomplish by going out again so soon. One thing pushing me a bit was that I was taking two weeks off and I didn’t want to sit home all week just because the weather wasn’t perfect! I’ve learned over the years that 9 times out of 10, if you get out there, the weather usually isn’t as bad as you think it will be. As I drove I changed my mind on the route I’d take. Originally I was planning on the shortest route as documented by Nugara in his guidebook, but as I drove closer towards the trailhead I noticed the low clouds and even rain coming down on surrounding peaks and decided that this might not be a summit day for me. I also noticed how freaking high Southfork looked from the road and knew that Barnaby was higher. 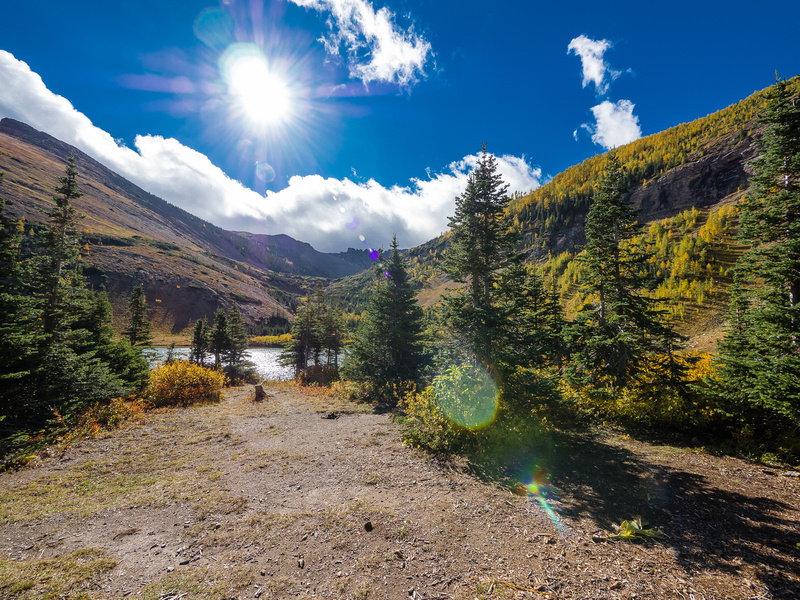 I decided to try Bob’s recommended route via the Southfork Lakes hiking trail and hopefully see some nice fall scenery around the lakes if nothing else. If the weather and my attitude improved I could still bag the peaks – albeit a slightly longer version than Nugara’s off trail route. Finding the trailhead was interesting. I turned off the main road (hwy 774) at a small blue sign on the left hand side of the road that had the number “5003” on it, down a narrow dirt access road. With the puddles and mud I was happy to have 4×4 but worst case you could just walk in this road – the trailhead isn’t far from the main road. I was following Bob’s GPS track to find where they crossed the West Castle River and I ended up finding a makeshift bridge instead. That was a nice bonus! I didn’t even have to get wet feet. Finding the trail on the other side wasn’t hard due to ribbons and a worn path, but without a GPS track I would have missed it on ascent. On descent I crossed the shallow river right by the truck and found a small sign indicating the start of the unofficial trail. 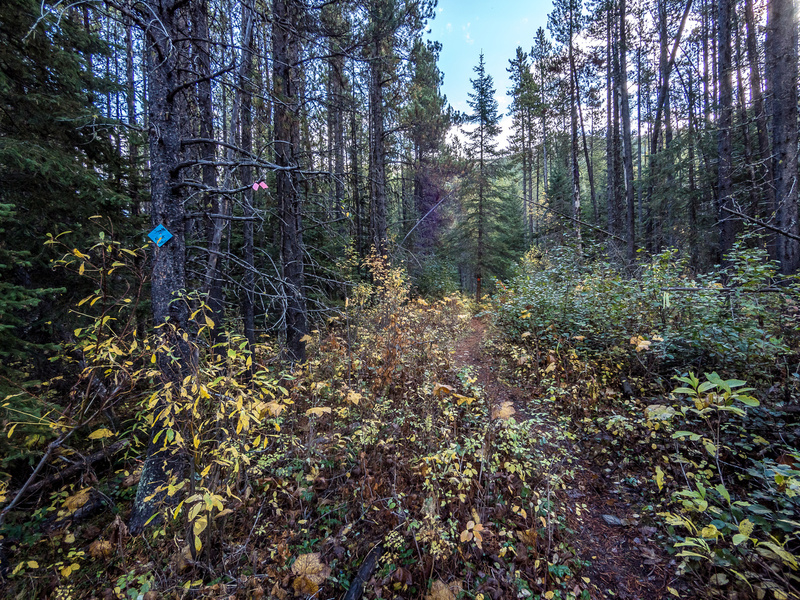 There are numerous ATV and hunting trails in the area so good luck finding the proper one if you don’t use a GPS. A very dry and desperate forest – but it manages to survive somehow. The weather wasn’t horrible as I started up the meandering lower trail. 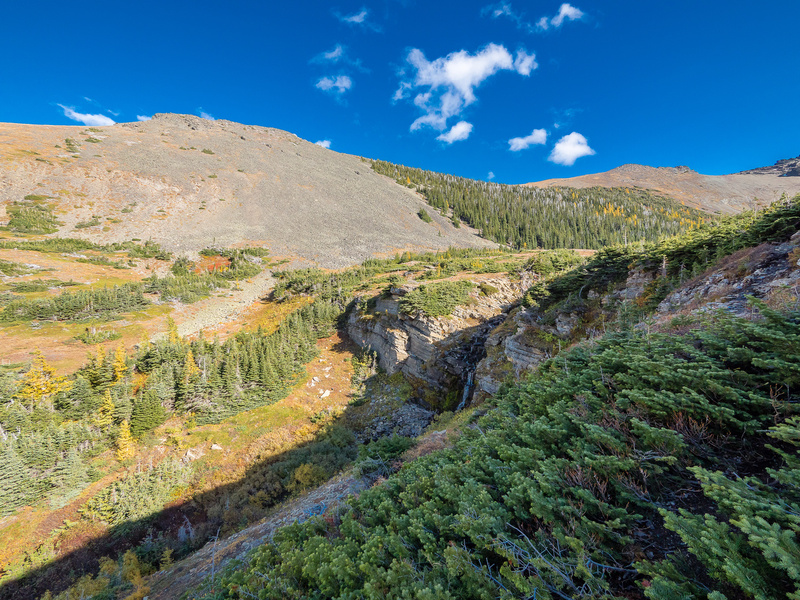 I slowly started feeling better as I gained height through open forest onto a lower shoulder of Southfork. I was tired but the scenery opening up across the West Castle was pretty darn sweet and the fresh air was rapidly clearing my head. 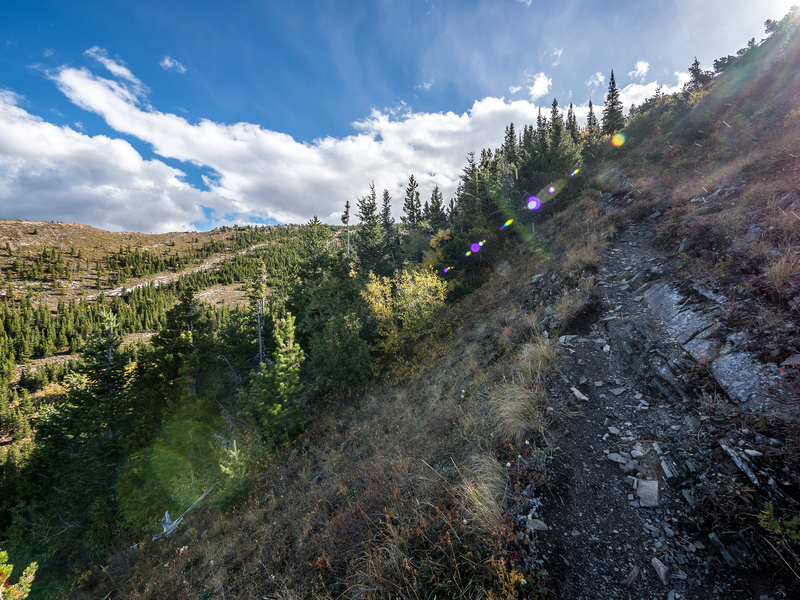 Soon I was following trail markers up steep switchbacks on an open, gravel shoulder head steeply upwards and curving gently towards Southfork. 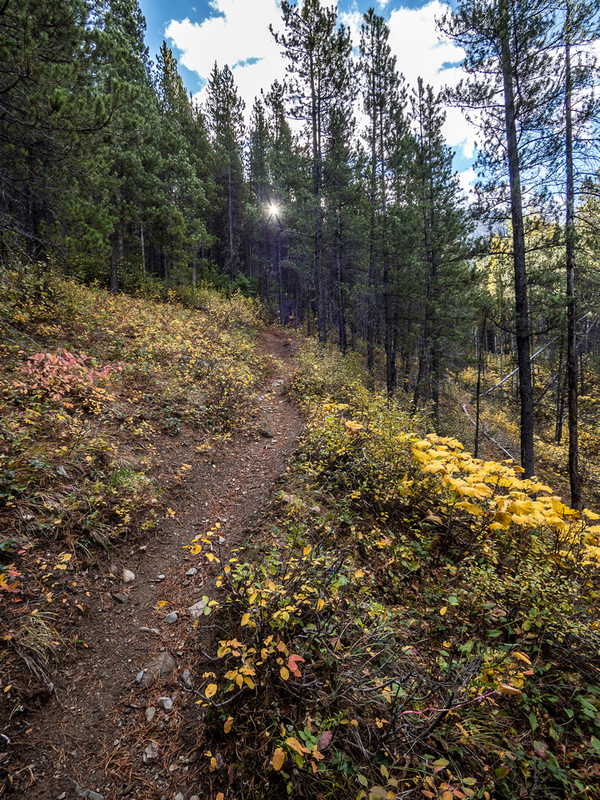 I was all alone again, and unlike in Banff the day before, there was NOBODY around me on this trail! A break in the clouds as I make my way over towards Southfork Lakes now. 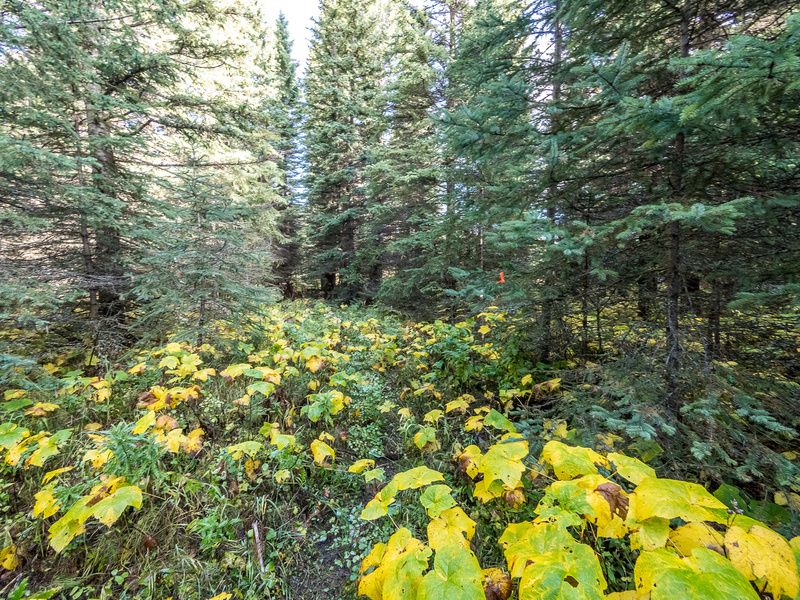 Eventually I topped out on the shoulder and followed the great trail back into thicker forest where it undulated towards Lower Southfork Lake, now following high above Barnaby Creek. I arrived at a fishing survey box before cresting alongside a small set of falls and coming up to the Lower Southfork Lake. 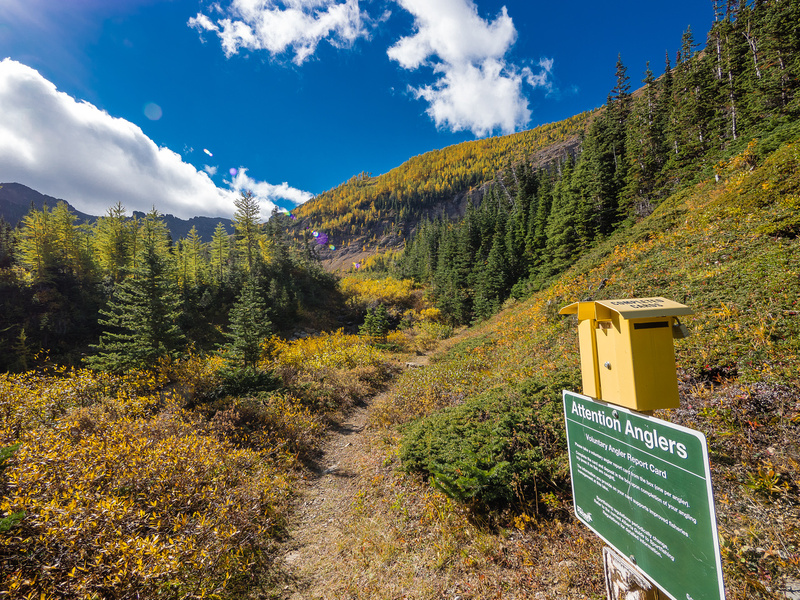 People obviously camp up here but it was clean and looked well taken care of – I was impressed with the lack of garbage that is usually associated with random backcountry campsites. Southfork Mountain itself was still shrouded in clouds but I pushed on towards the Middle Southfork Lake – again on an excellent trail. Working my way around the lovely Lower Southfork Lake. 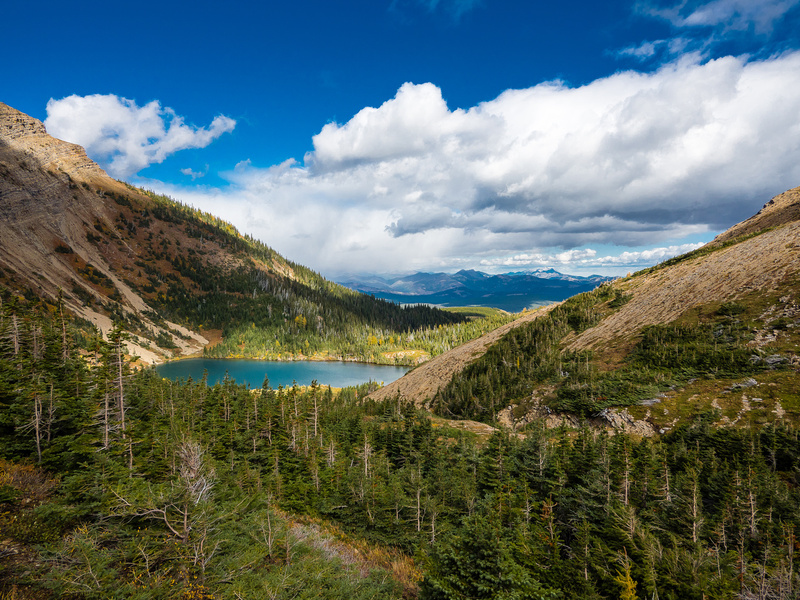 The trail navigated a headwall between the Middle and Lower Southfork Lakes, going through thick Krumholtz and up small rock steps until I was staring at another beautiful backcountry lake surrounded by a pretty incredible larch forest on Southfork Mountain’s north and east slopes above. I fully expected to see a large grizzly tearing up the slopes around me, but thankfully this didn’t happen with me there. I had made decent time to the lakes and really didn’t want to go home already so I turned my attention up to Southfork Mountain. The eastern slopes looked really easy so I simply followed them up, reasoning that worst case I could bag Southfork and come back for Barnaby Ridge via Nugara’s route sometime later. 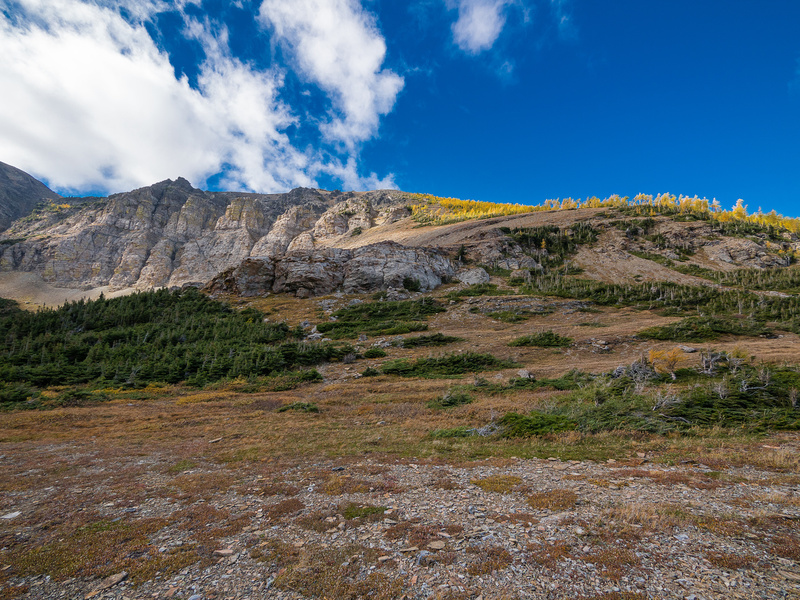 After wading through a very intense larch forest I followed the rubbly, block north ridge up towards the summit. The clouds were still swirling furiously around the local peaks but my views were pretty darn sweet across to Haig and Gravenstafel and east towards Table Mountain. 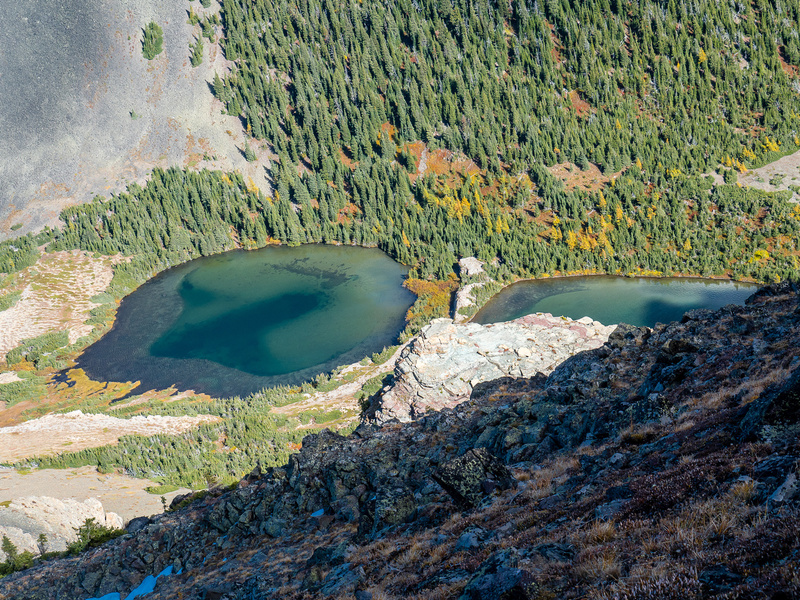 Looking down at the two Upper Southfork Lakes from the ascent slope. The lower lake out of sight at left. Coming up on the north ridge, looking back at the approach gap and towards Table Mountain over the larch forest. I summitted in a cool wind and ducked out of it to decide what to do next. I put my Gore-tex pants on and decided to traverse along Barnaby Ridge for an hour. After that I’d make a decision to either turn back or summit Barnaby. Obviously I decided to make my way over to Barnaby and I did manage to successfully summit and return back along the ridge to Southfork Mountain. 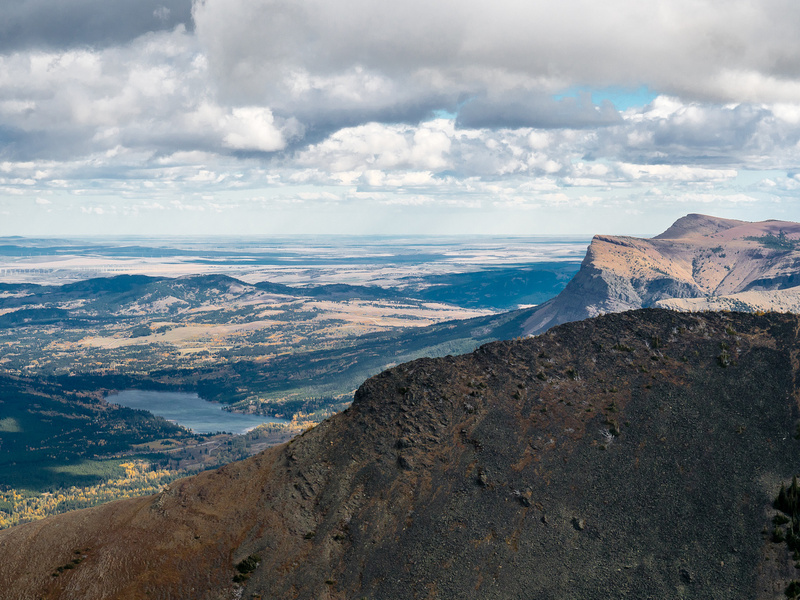 Looking over at the Castle Mountain Ski Resort. 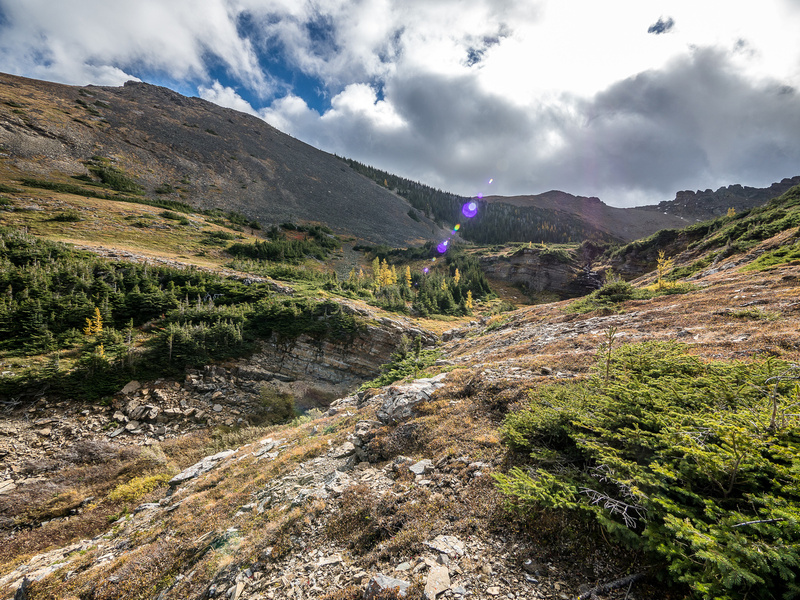 As I dropped back down to Southfork Lakes from the summit of Southfork, I noticed the different lighting from earlier. The hike out was fairly quick and enjoyable for the most part. The few places of height gain on return hurt though. When I got back to the West Castle River I simply walked through it (ankle deep) with my shoes on, which took me directly to my truck. I also noticed a small home made sign marking the trailhead. 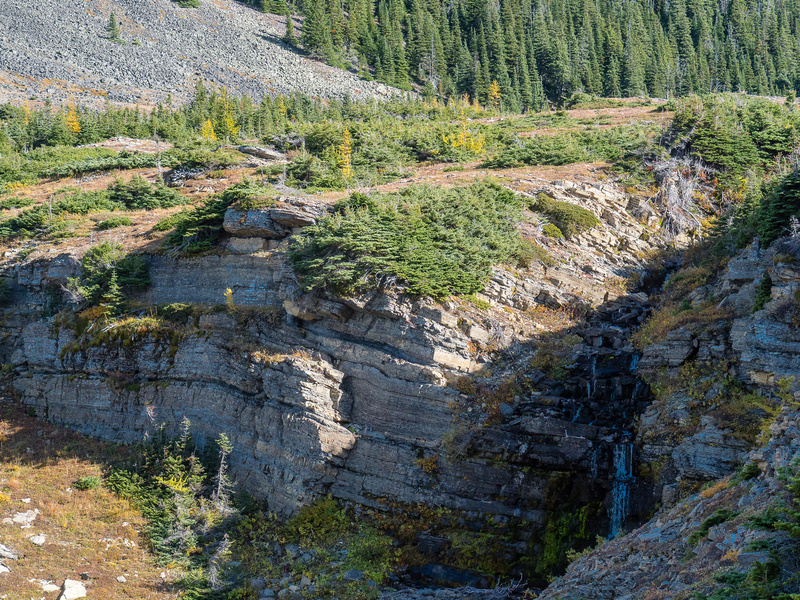 The headwall has a nice waterfall coming down from the Middle to the Lower Southfork Lake. 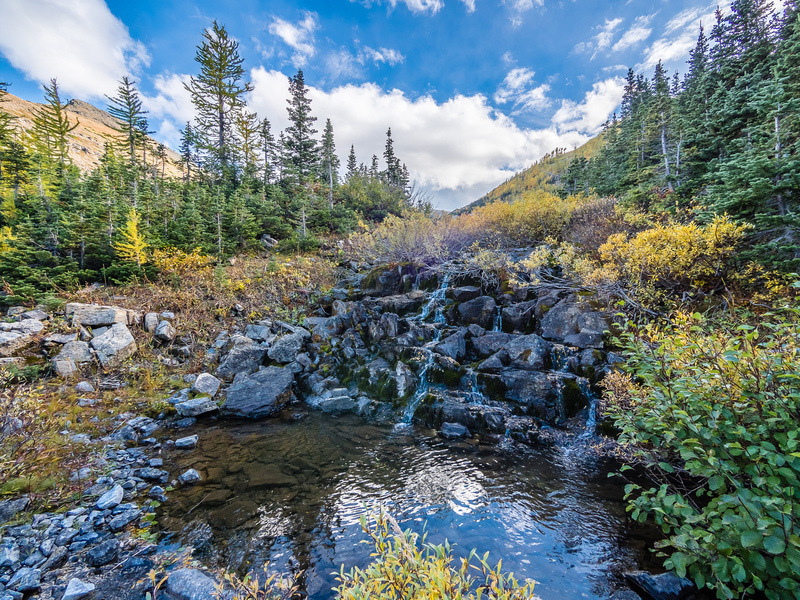 Barnaby Creek flows out of the Southfork Lakes. The river from where I parked. On ascent I ventured left about 500m to find the makeshift ‘bridge’, on return I simply waded straight across – shin deep at most. Southfork at upper right and the ascent ridge hidden at center distance here. 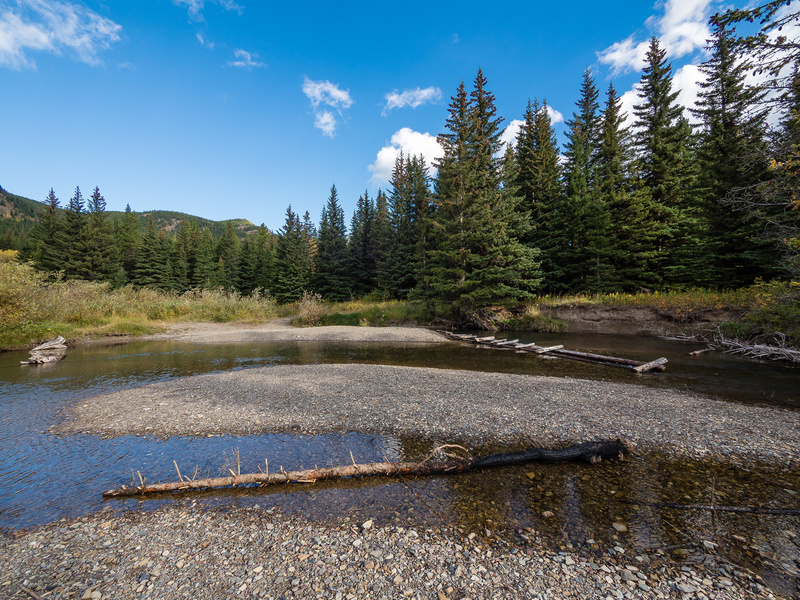 Southfork Lakes are a worthwhile destination on their own. Adding two peaks always elevates the day a little bit. 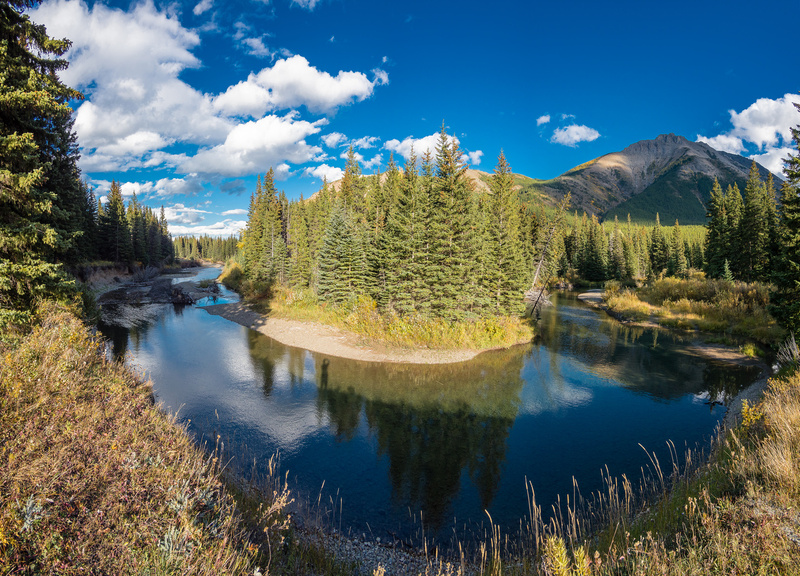 Another ‘winner’ in the Castle Wilderness. But aren’t they all? The makeshift 'bridges' that I used to cross the very low West Castle River. A hand drawn sign shows me the way to "Southfork Lakes". 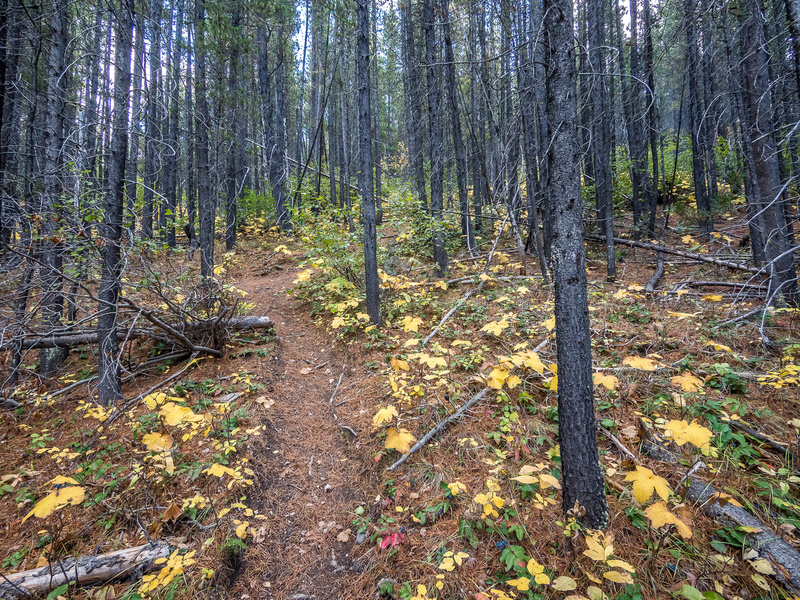 As I work my way up the east ridge the trail becomes very well defined in the thin and dry forest. A very dry and desperate forest - but it manages to survive somehow. 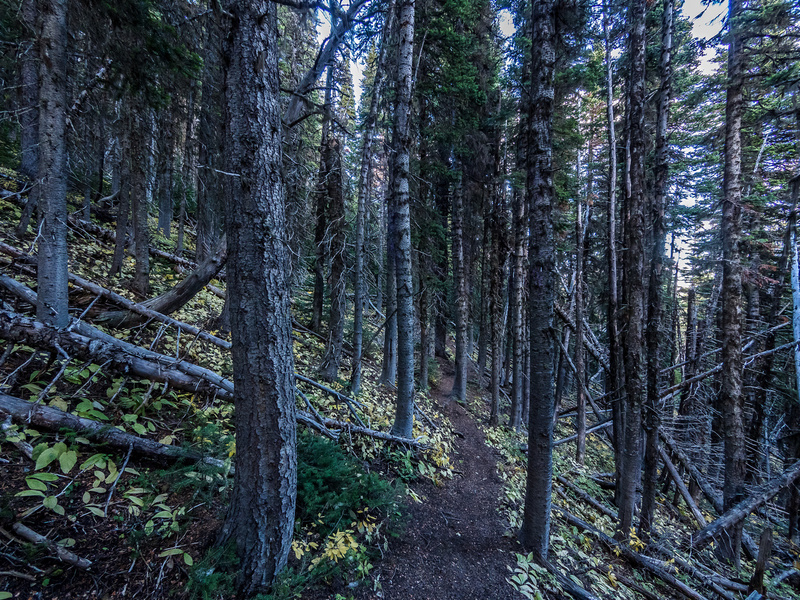 The trail breaks out of the trees fairly low down and nicely sticks to very steep open terrain, granting great views early on. Views towards Southfork Mountain from the west ridge. Gorgeous views towards Syncline Mountain - this makes the weather look a bit better than it was over my two peaks. Nearing the first lake, I come across this fishing registration box (no cards) - I guess it must have fish! Coming up to the Lower Southfork Lake. 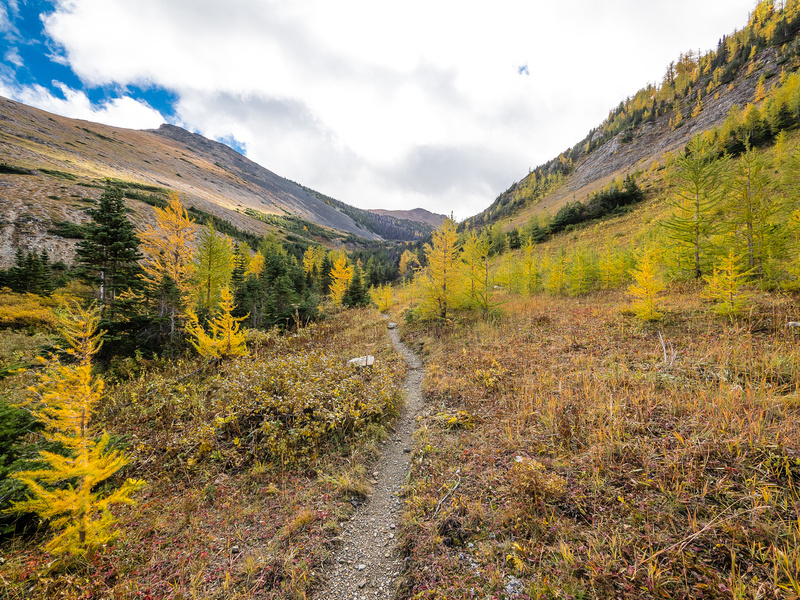 The trail heads through brightly colored larches towards the small headwall between the Upper and Lower Southfork Lakes. Looking back at the Lower Southfork Lake. Nice moody landscapes as I work my way up the headwall. 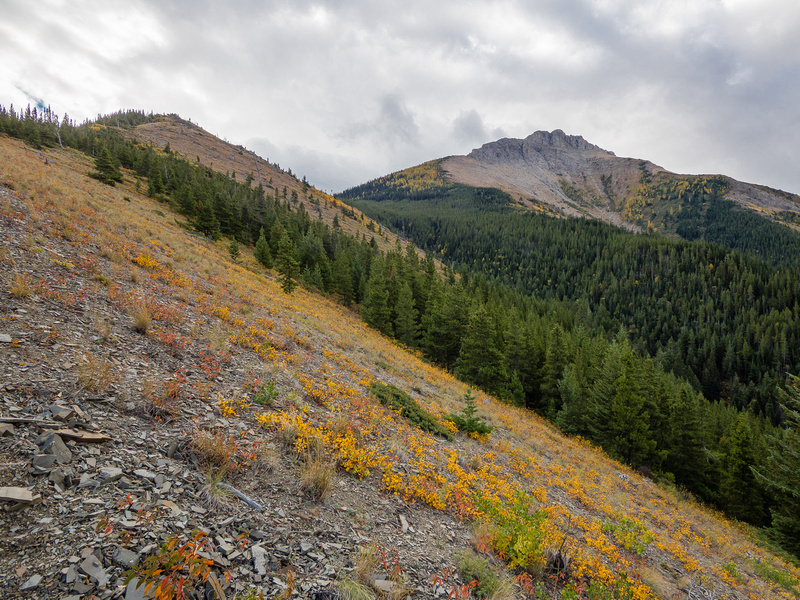 Gazing up the east slope towards the summit of Southfork and the awesome larch forest higher up. 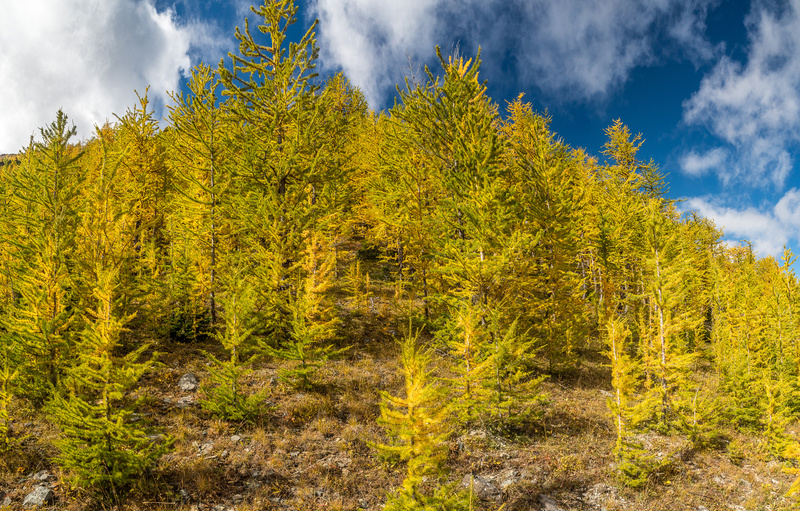 Getting closer to the larch forest. 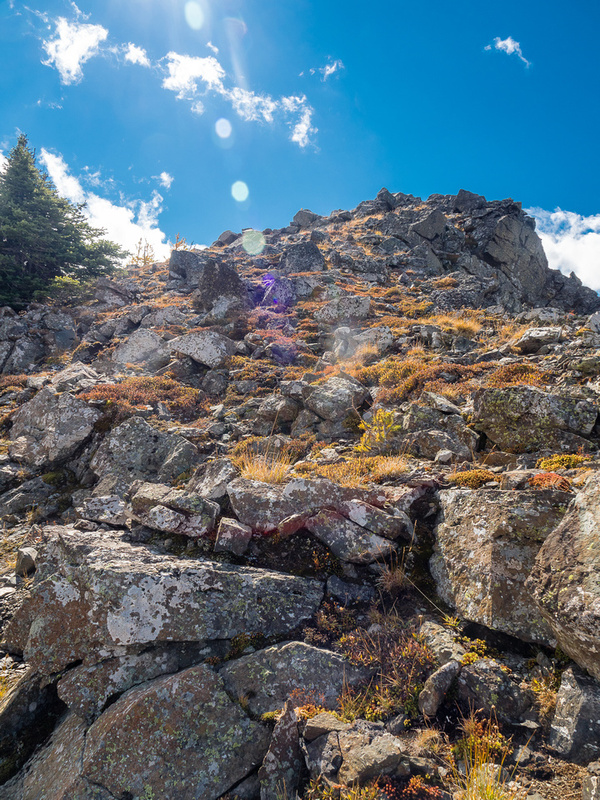 The weather is cooperating as I look up to the summit along the north ridge. 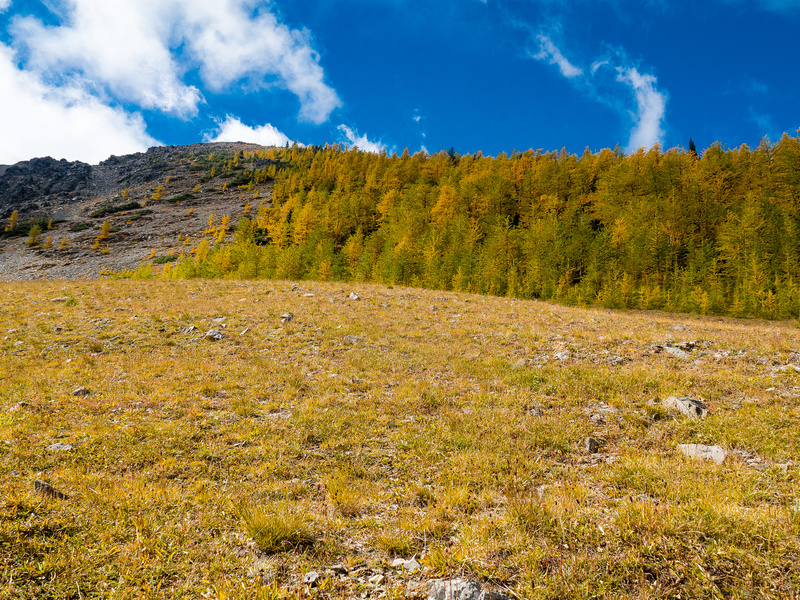 The larches extend quite high on the east side of the north ridge. Table Mountain at distant right, Beaver Mines Lake at lower left. Looking north over the ridge and towards Syncline at left and the moody weather moving in from the west. Looking south down Barnaby Ridge (summit out of sight here) and debating about the rest of my day. Traversing back to Southfork along Barnaby Ridge, Middle Southfork Lake at lower right. 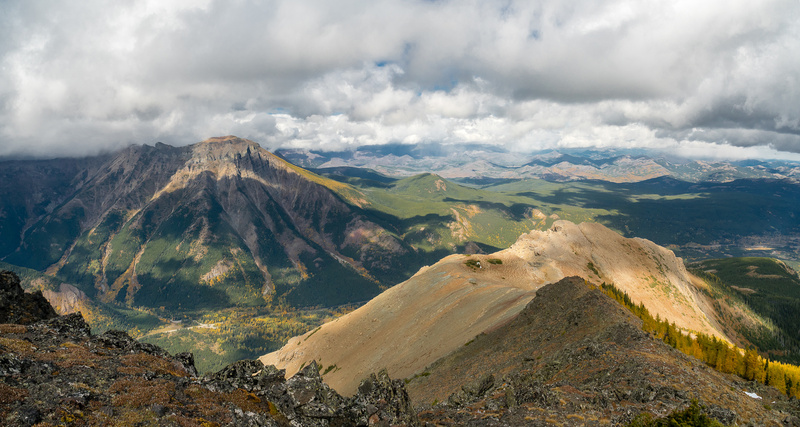 Stunning views north towards the Crowsnest Pass area from the summit. Great lighting on the larch forest and the lakes as I start down Southfork. 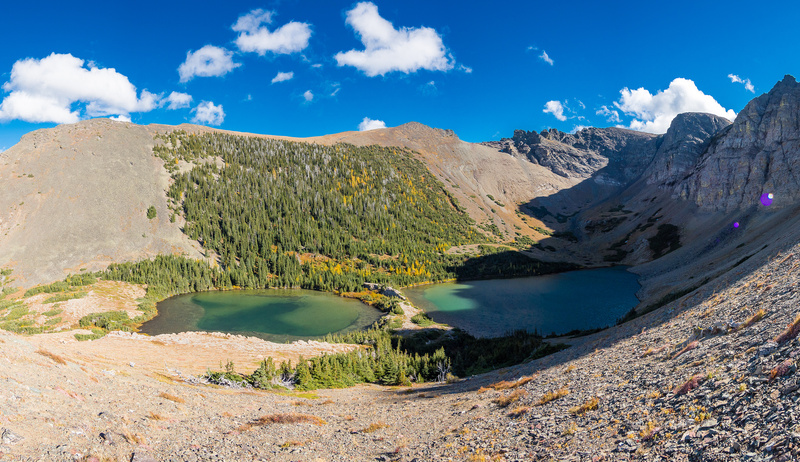 Middle (L) and Upper (R) Southfork Lakes. 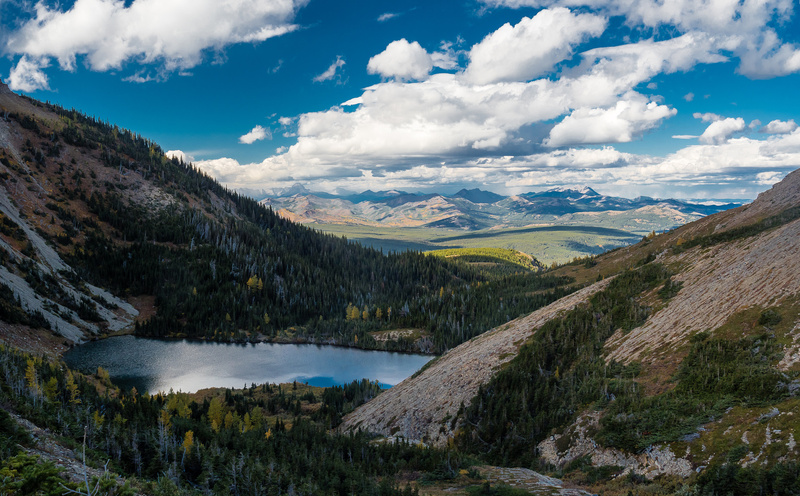 The lovely alpine bowl with the two higher Southfork Lakes. Great views over the Lower Southfork Lake. The gloomy forest on return. Back in the lower forest. 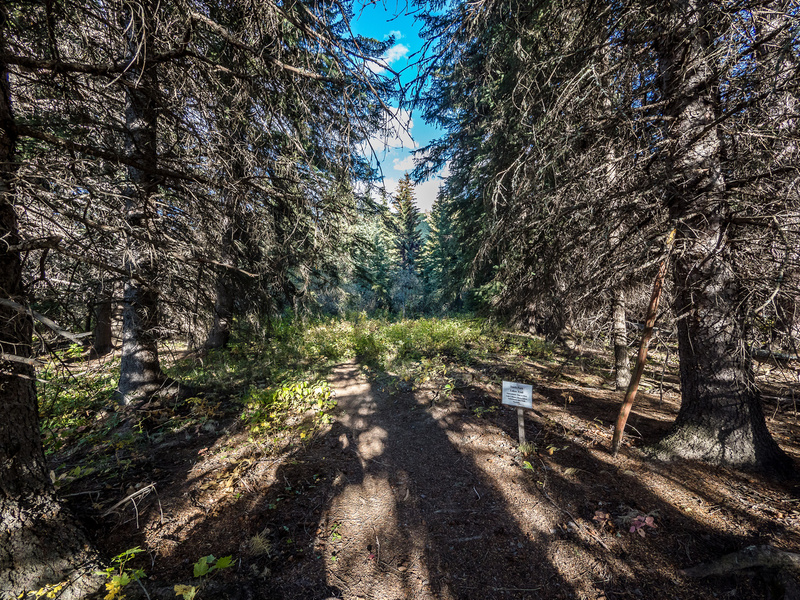 The small home made sign indicating the start of the Southfork Lakes trail. On ascent I ventured left about 500m to find the makeshift 'bridge', on return I simply waded straight across - shin deep at most.